Comment by moderator, 5/21: This has become such a great thread, thanks to D'Ambrosia, that we mods have agreed to make it "sticky," so it stays at the top of the topics in the forum. That way it can serve as a reference for the site for all sorts of gun questions. And I'd like to ask that everyone respect D'Amb's hard work here and refrain from making any posts that might take it off topic. If you have any questions about his research, or you have anything to add about any of the guns (but please make sure you know your stuff! ), that's fine, but otherwise, let's let him work in peace! sudden impact saw a very unusual gun, any body knows about this one. Well, if I’m to do this right, and I’d very much like to, I’d like to start in chronological order from first gun to last…. Clint has the capability to use these guns... I will list all guns that he may have had use of, but may or may not have used in the movies. 40 mm Bofors cannon, aft. Armament: Four M-39 20mm cannon or six .50-cal. machine guns; eight 5 in. rockets, 2,000 lbs. of bombs, napalm or nuclear weapons. Unknown at this time. Anyone seen Clint in this one? The pistol that Blondie uses in the Good the Bad and the Ugly is a modified 1851 Navy Colt (modified, no doubt, by a dubious gunsmith). It has been converted to fire metallic cartridges which was extremly rare in the day but a few guns around then could fire these bullets (Smith and Wesson). The technology was there but the mass production was not. Both the Union and Confederate States stalled and delayed the new metallic cartridges in fear of their armies wasting ammunition and costing too much to manufacter. One of the most popular of Civil War revolvers was the Colt Model 1851 in 36 caliber. Around 250,000 were made by Colt between 1850 and 1873. It had a six shot cylinder and a 7-1/2" octagonal barrel. The standard cylinder featured an engraved scene of a naval battle. The Navy designation meant it was 36 caliber. 44 Caliber were known as Army, but both terms are merely convenient marketing designations. This model was carried by such different men as Robert E. Lee as the Confederate Commanding General and by Wild Bill Hickock as the Sheriff of Abilene. 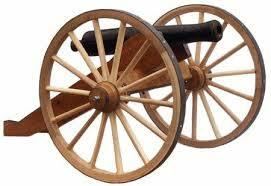 It was loaded with loose blackpowder and a bare bullet, referred to as "cap and ball," or with paper cartridges. Loading a cap and ball revolver is from the front of the cylinder. Misfires in cap and ball revolvers were more common than in the subsequent metallic cartridge guns. The misfire problem was well enough known to be commented on when it didn't happen after unusual circumstances. The '51 Colt carried by Robert E. Lee made the commentaries. When it was shot after his death in 1870, every chamber fired when it had last been loaded during the middle of the War about seven years earlier. Here is a shot of Blondies revolver. Brass was used in abundence durning the war due to how cheap it was compared to steel. All guns in the period could have been made out of one or the other it was just a matter of cost. Clearly you can see that there are brass pieces on Blondies gun there. Although there were metallic cartridges during the Civil War (Smith and Wesson, .44 Henry Rimfire, .22 Short and .56-56 Spencer to name a few) Leone thought to put the barrel of an 1851 Colt Navy on the frame of an 1851 Navy that had been changed to the Richards-Mason cartridge conversion which didn't happen until 1871? 1871 is when the breech loader patent held by Smith and Wesson ran out and companies could began to manufacture legally bore though cylinders. However who is to say that if you had enough money and knew the right gunsmith and had access to metallic cartridges, well, Faster to reload and saves time - I suppose that was their reason. Even better, look at Lee Van Cleef's belt - you will see metallic cartridges in the loops, even though there are percussion caps on the cylinder of his revolver. Today original Henrys are collectors’ items commanding high prices. These start at around $6,000 and go up from there. There has not been ammunition produced for years and what can be found is also highly collectable and too expensive to shoot. D'Amb, this is wonderful stuff! Please keep it up. The Colt Single Action Big Bore Trio was completed in 1886 as the second '73 Winchester chambering was added with the .38-40 or .38 Winchester Center Fire. This time the same powder charge of forty grains propelled a 180 grain bullet. So it fired a rifle metallic cartridge just as it’s predecessors did? Interesting? The ’86 fires a 38-40 or .38 Winchester Center Fire. This time the same powder charge Cooper had of forty grains, propelled a .38 cal180 grain bullet, as opposed to Joe’s and Manco’s larger and heavier 200 grain .45 bullet ’73. If we establish that FFDM takes place after or before ’86, that is the question…? 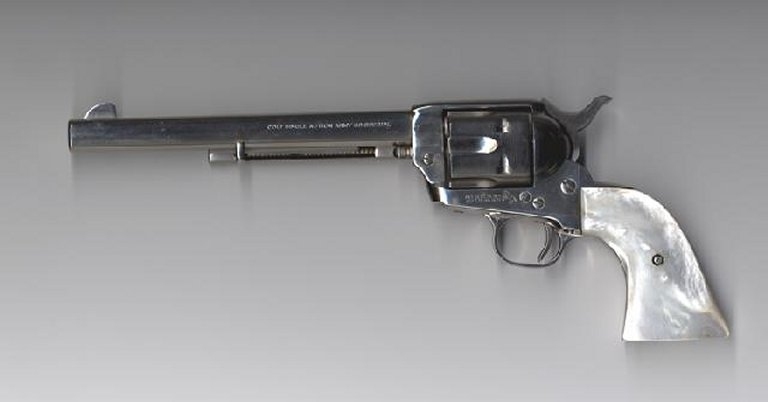 That would actually make Manco’s revolver a 2nd model ’77 Peacemaker but who wants to get technical?…. 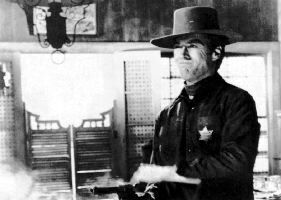 I’m still not convinced that Manco is not in the time period of the latter half of the 1880’s thus, possibly, making his pistol a 3rd model’77 Peacemaker but we’d have to establish the year of the movie now wouldn’t we?. The pistola he carries, once again I must refer back to the quality of my source material, seems to be, in the brief three seconds we see it, a .38 Special. Either Colt or Smith Wesson. Can’t really tell which (maybe when I get the DVD…J). Sticking with the tradition of Joe,Manco, Blondy and Cooper, I would like to think of it as a Colt .38 Special. The difference between the two is that Colt is somewhat roundish than the relatively boxier S&W. The Space between the trigger guard and the handle on the S&W is much more sqaurded than the Colt. Does anybody know what gun Clint uses in "The Outlaw Josey Wales"?? It has a strange bar running from the trigger to the barrel, never seen anything that exacally matches it. If you get hose wounds a'leakin, I'm gonna womp yuou with a knotted plow line. Welcome to the board Josey-Wales. I might mention that the rifle he uses is not a Spencer as I had suspected but that will soon be corrected. Clint uses "The Machine Pistol", as it would translate from German, as a killing machine (as the narrator from The Man From Malpso called him) is that of a very clever German made cartridge. Surly you've heard of it in one capacity or another. The MP-40 9mm Schmeisser could fire upto 500 rounds a minute spitting off a115 gr. FMJ 1375 ft/s at 3 impacts on 4" triangle. Capacity Thompson (M1928A1): 50-round drum & 20- and 30-round detachable box magazine. 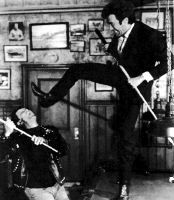 Manco with a Tommy Gun? Churchill with a "Tommy Gun"
Until the outbreak of the Spanish-American War in 1898, John Thompson’s military service was routine and uneventful. During the War, he used his weapons training to its fullest advantage. He became a small arms specialist, and took charge of the Army’s ordnance supplies and logistics. In November 1914 he retired from the service with the intention of devoting his full time to perfecting an automatic rifle. He was to join Remington Arms Company as their Chief Engineer. Thompson’s primary interest remained the development of an automatic rifle. He believed an "intermediate" automatic weapon in the ballistic class between the pistol and the rifle would be a requirement in future wars. The first gun produced, bearing neither model or serial number, appeared in 1918 and was belt fed and with little resemblance to later Thompsons. This was followed by the Model 1919 in AS caliber. Provision was made for feeding by a box magazine while the rear grip was placed near the back of the receiver. One distinctive feature was the firing pin fabricated as forward extremity of the actuator. The cyclic rate of fire was approximately 1,000 rounds per minute. Some reports indicate that prototypes were made to fire various calibers. Despite its excellent test performance, the Thompson was not adopted for use by either the US Army or Marine Corps. Still, Thompson contracted with Colt for the manufacture of 15,000 guns, designated "Thompson Submachine Gun, Model of 1921". The 15,000 guns manufactured by Colt lasted until the eve of World War II. In 1940, the U.S. Army ordered 20,000 Thompson submachine guns; in 1941 the Army ordered an additional 319,000. Prior to this date, however, General Thompson's "trench broom" found great favor with the Prohibition-era gangsters of the Roaring Twenties, so much so in fact, that years before official adoption into military service, the Thompson SMG, alias the "Chicago typewriter," was fast becoming a household word. Used by the Capone mob and equally violent factions during the gang wars of the 20's and 30's, the Thompson blazed its way into history in such a fashion that it is credited for largely contributing to the National Firearms Act of 1934, which was intended to keep concealable firearms, and silencers out of the hands of such individuals. Up until that time, the Thompson was available to anyone who had the money and wished to purchase it. Incidentally, the price tag on one of these guns, $200, was a considerable investment in the 1920s. In Sudden Impact Eastwood uses a .44 Magnum Automag when his trusty .44 S&W is kicked into the water. Thanks, Mr. Pants ... DAmbrosia is going through Clint's films chronologically. He'll post information about the Auto Mag (which is one of the best-known Eastwood guns) when he gets to Sudden Impact ... probably in a few weeks! See the note at the beginning of this thread. Oops, didn't mean to steal anyone's thunder. Sorry 'bout that. Carry on. Feel free to post away about Eastwoods Guns. That's what this thread is all about. I'll be getting around to every movie sooner or later.